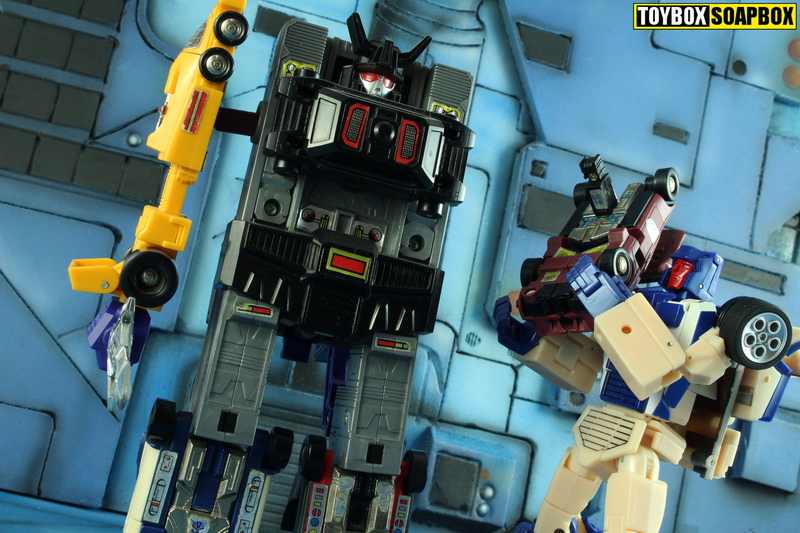 As a kid, the Transformer toys I saw the most in shops were The Stunticons. Those maniac sports car robots were everywhere and clogged up almost every Transformers display in each toy shop across Nottingham. Or that was how it felt in 1980 something. I swear there are probably still couches around here with Stunticons stuffed behind the cushions. Not that any of this diminished my love for the Stunticons, far from it, it made them easier to get so they were one of the three combiner teams I actually managed to complete as a child. Where the Aerialbots were all jets, the Stunticons were the antithesis, turning the traditional ‘Autobots rule the roads, Decepticons rule the skies’ mantra on its head. In a toy line well stocked for cars this bunch still managed to stand out with their unique modes, even at such a small scale. Clearly I am a fan but even I am not too fussed about Masterpiece scale combiners. The cost of buying into a set is usually pretty high and there isn’t a great range of shelving units down my local Argos with enough room to accommodate many of them. 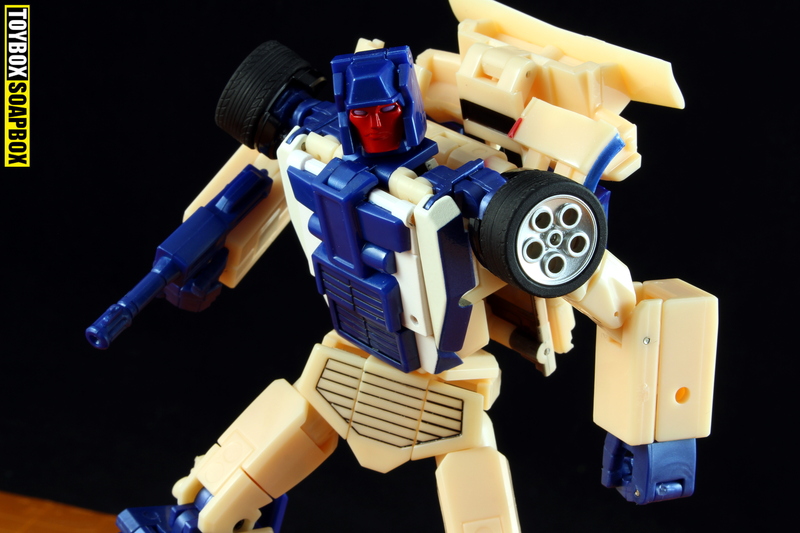 However X-Transbots made the decision to drastically lower the price with their Berserkars, the first of which to land is Crackup – an homage to G1 Breakdown – and at £40 it’s a bargain too good to dismiss. They have me hook, line and sinker. So what better excuse to play with robots than writing an article about them and talking to the toys chief designer. That’s right, this article is part interview with 598 Robots. Double the value! 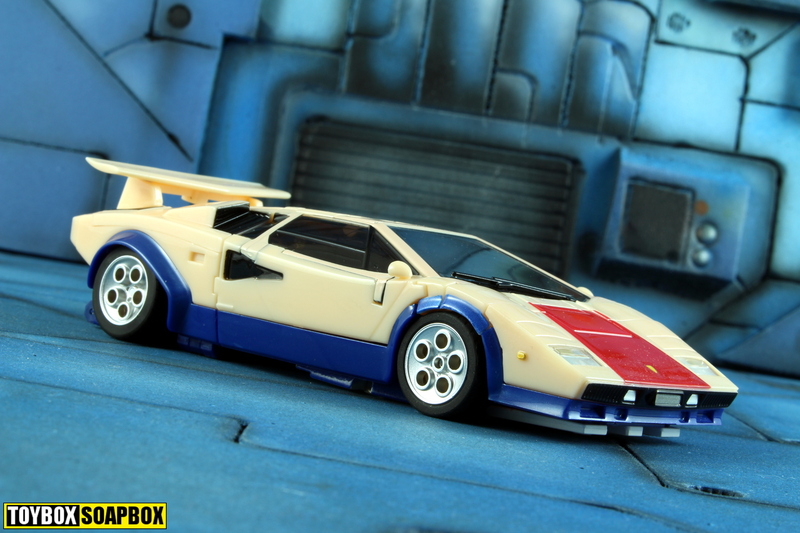 Paying homage to Transformers G1 Stunticon team member and frequent combiner shin, Breakdown, Crackup has opted for that most iconic of 80’s sports cars as his chosen disguise – the Lamborghini Countach. Setting it’s stall out early, this toy follows the current Masterpiece template of fusing a real world vehicle mode with an animation inspired robot form and whilst it may not come with an “officially licensed” sticker, it’s a beautifully faithful rendition of the car that came to define the decadence of the 1980’s. A decade I’ve yet to let go of to the point that someone left a comment on this website moaning about it! As I previously mentioned in my Masterpiece Sunstreaker review, (go on, have a read) the Countach is amongst the most ubiquitous vehicles from the original Takara and Hasbro lines. I reckon I could fill a paddling pool with robot toys based on it at this point. There’s Red Alert, Sideswipe, Sunstreaker, Breakdown, Micromaster guy, Brainmaster guy and a variety of others keeping the spirit of the car that looks like a rolling spade alive. Crackup’s car mode locks together nice and tightly. 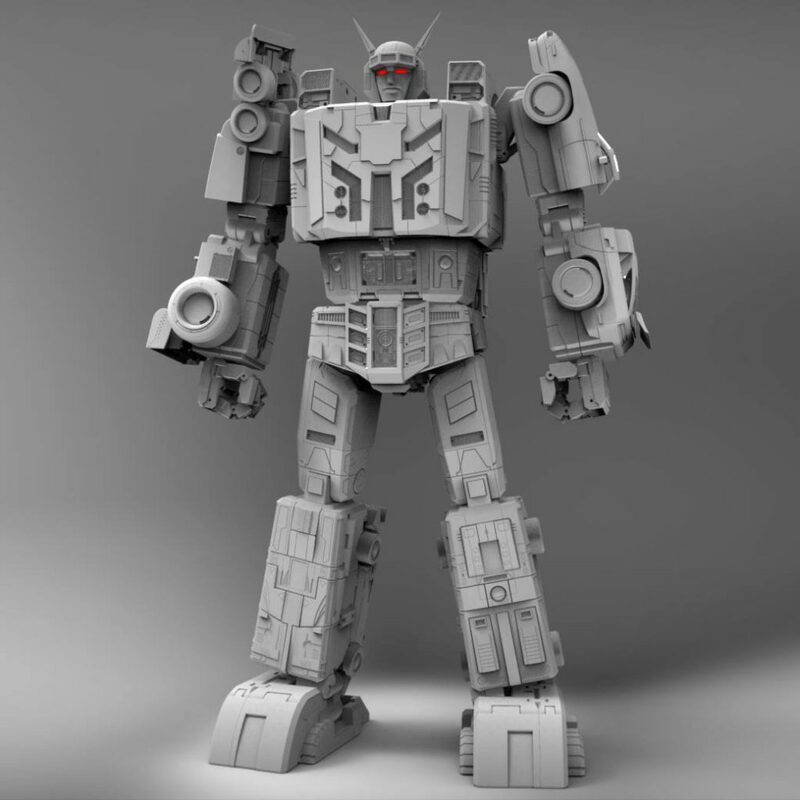 None of the gaps that afflict the sides of the various incarnations of the MP-12 plague him owing to the different way he approaches moving from car to robot. One minor quibble I have is one of the doors is very loose, causing it to pop out often in car mode, but that is why I have a big bottle of Pledge sat next to my desk and my girlfriend is always asking me where the paint brushes have vanished to. Crowd pleasing rubber tyres make a welcome return but the ability to roll smoothly, or at all, can be hindered if you haven’t quite transformed it correctly. The vehicle’s base sits very low to the ground already so any hiccups with transforming him and he’ll protest against rolling. Certain parts, like the hands and feet in particular seem to be the cause of this as they have to be set in very specific positions in order for everything to align perfectly. But once you know what you are doing it’s an easy thing to avoid and you’ll enjoy gazing at an incredibly clean alt mode. 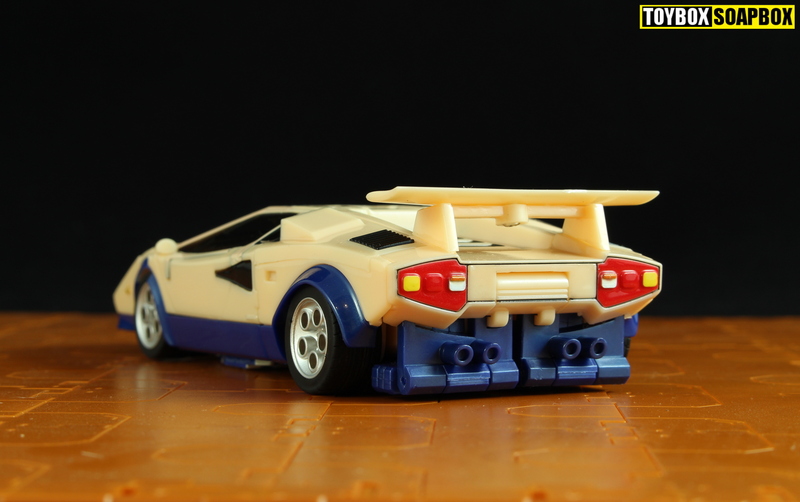 Probably the least broken up Lambo so far which is amazing considering he has three modes. Kind of. Enter into any discussion about this toy and one of the first things to come up is the colour. Modelled on the vintage character’s original toy and animation forms, most of the car is moulded in a striking shade of off white plastic. 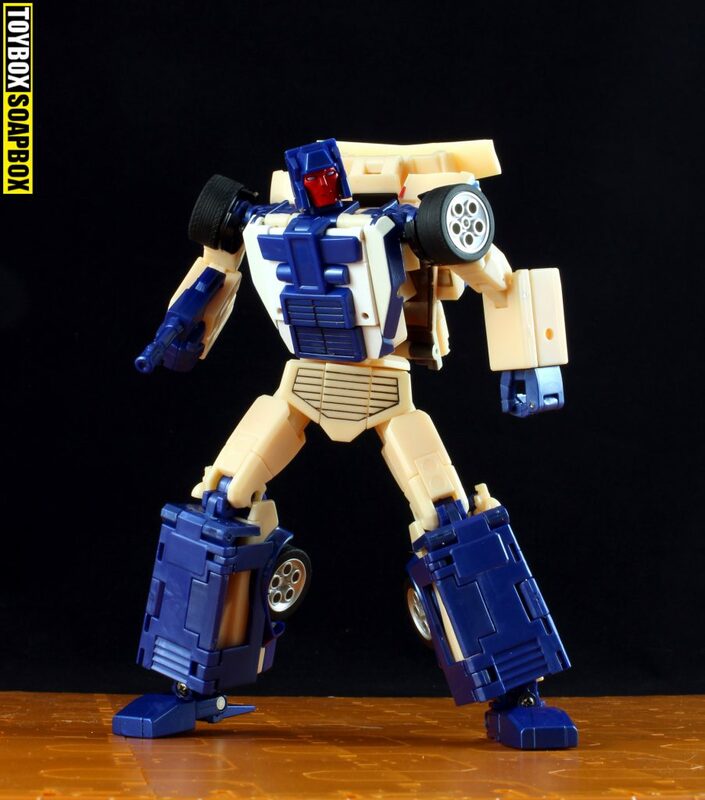 Even though it’s very accurate, there is still a portion of people who remember Breakdown as being a bright white. “Our memories are not collective. People remember things differently and base their understanding of a character from different interpretations.” posits Crackup’s chief designer, 598 robots, when asked about this. It’s an important point to raise, choosing a toys colour is not always straightforward when we are dealing with characters who have seen many different interpretations over more than three decades. “Color can be difficult.” 598 explains, “if it’s not a bright primary or secondary color there’s a lot of back and forth. A lot of pausing episodes and sifting through galleries. Then pantones are picked out. Then plastic samples are made. Then they’re changed photographed emailed back and forth and changed”. As a result of this process Crackup’s colouration is pretty spot on to the vintage toy and animation model, which is entirely what this figure is aiming for. It isn’t trying to re-interpret the character – it’s attempting to capture a specific moment in time. Going with a lighter white would also have made him look too much like a Red Alert who already has the paranoid white and red corner of the Lamborghini market covered. There aren’t really any other features to speak of. 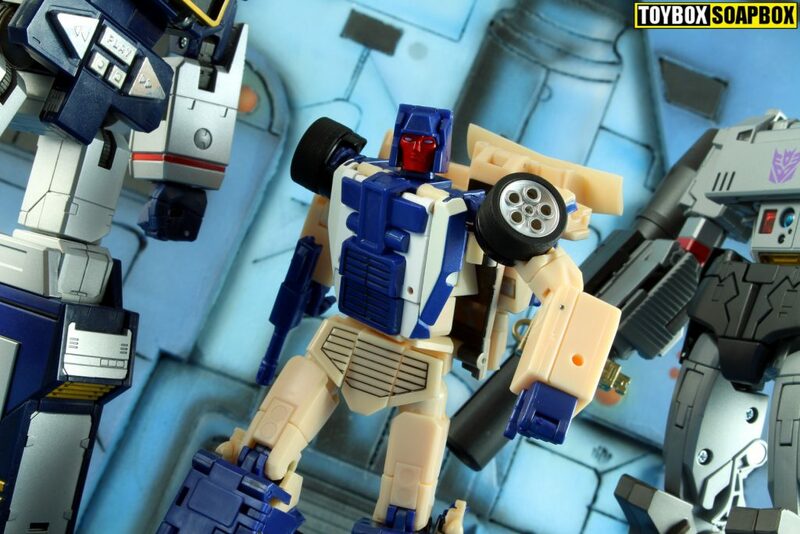 If you a fan of weapon storage then fear not, as there is a small slot on the back of the vehicle that can hold Crackup’s pistol to give him a fun battle mode of sorts. A small hinge in the handle of the pistol allows it to point up or down so you can pretend he’s shooting the pigeons out of your garden if you desire. MP Sunstreaker added pop up lights to the mix as a feature I never knew I wanted until the did it. Sadly this didn’t make it into Crackup, but 598 has a good reason for this: “These guys were designed prior to his release and a few were in production by then. Had I known that was their intended direction I would’ve tried to include them in ours.” which is fair enough. Car mode is going to be his least lived in anyway. It is quite amazing how well Crackup blends in with the Masterpiece crowd. Not just in looks but also feel. This feels like something that belongs on a Masterpiece shelf and in some ways it actually one ups the toys it’s designed to complement. That is mainly down to how clean it looks due to the elegance of the transformation hiding most of the joins and hinges. 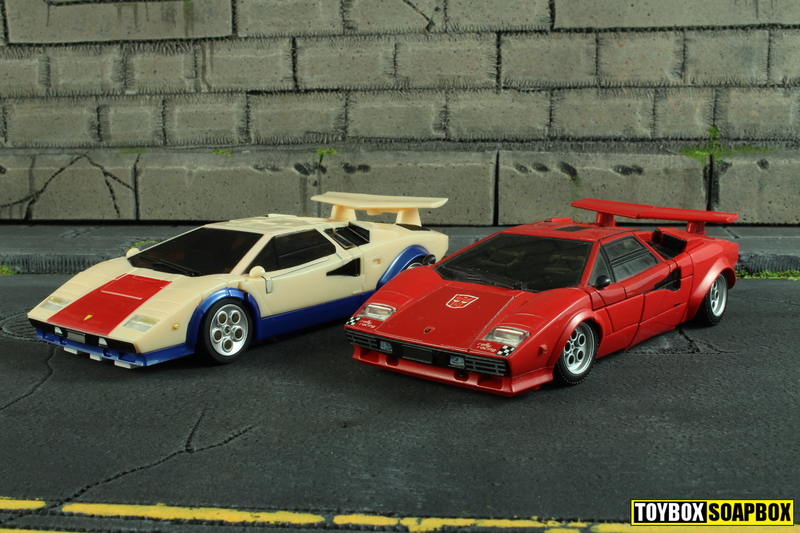 Having owned so many Lambo MP figures already, mostly based around one mold, it’s refreshing to see something that is as different as MP Sunstreaker, yet as intuitive and easy as MP Sideswipe. Crackup’s robot mode is just as clean as his car form. From the front the only visible car parts are the wheels sat atop his shoulders as everything else folds away neatly out of sight. The back wheels move into the insides of the lower legs to maintain the strong attention to animation detail, which was a personal highlight for 598: “the g1 toy has the tires up front on the shins but the toon pushed them to the back and they’re on the inner shin. So I had to spin the thighs 180 and then the waist 180 degrees. Everything sort of fell into place after that”. This move gives the legs an incredibly clean look as the door panels give the side of each legs one solid flat piece, whilst flip out panels create a blue shin block that hides any hint of a car and complete the cartoon look. If you aren’t a fan of cartoon accuracy then it can come across as plain, but at the same smaller size of the Masterpiece cars the lower level of detail of the animation models impacts the visuals less than it does on larger figures and in contrast the flatter areas help what detailing is present stand out. Your eyes aren’t distracted with lots of little bits and bobs on a busy design. Instead the red of the lovely face sculpt draws your eyes to it and you can take in the whole robot. If you are a cartoon fan like me then you will probably be going as gooey eyed as Alan Shearer every time he sees a headed goal at the World Cup. Aesthetics are an important part of any figure and Crackup features some interesting choices in that regard. Panels flip out from within the torso during transformation that fill out the sides of his upper body and prevent him from looking hollower than my wallet at the end of each month. Not having combiner gubbins in there allows room for such extravagances and it’s a lovely touch that helps add to the sense that this figure is finished and well thought out. Crackup’s backpack may stick out a bit much for some folks tastes but really it’s just the spoiler (not the kind to annoy Thanos). Most of it cleans up quite nicely and hugs his back tighter than me when it’s my round at the bar. 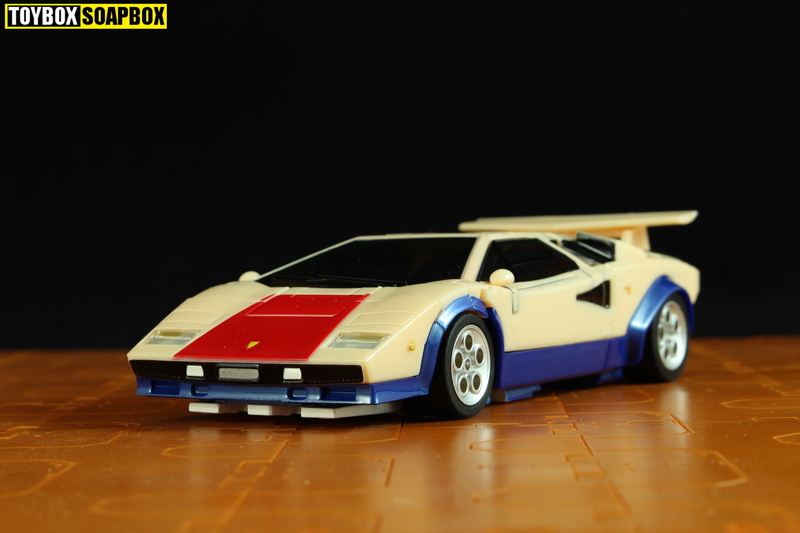 However, the spoiler placement is G1 accurate which is the what 598 was gunning for. On this theme, my personal favourite touch is the black brake plate which hugs the tyres on the shoulders subtly widen the tires. If I was writing a Jurassic Park themed review I’d have to use “Clever Girl” here. The colour in robot mode is of course the same lovely cartoon/vintage toy accurate off white which is making me crave a multi-pack of Milky Bars. 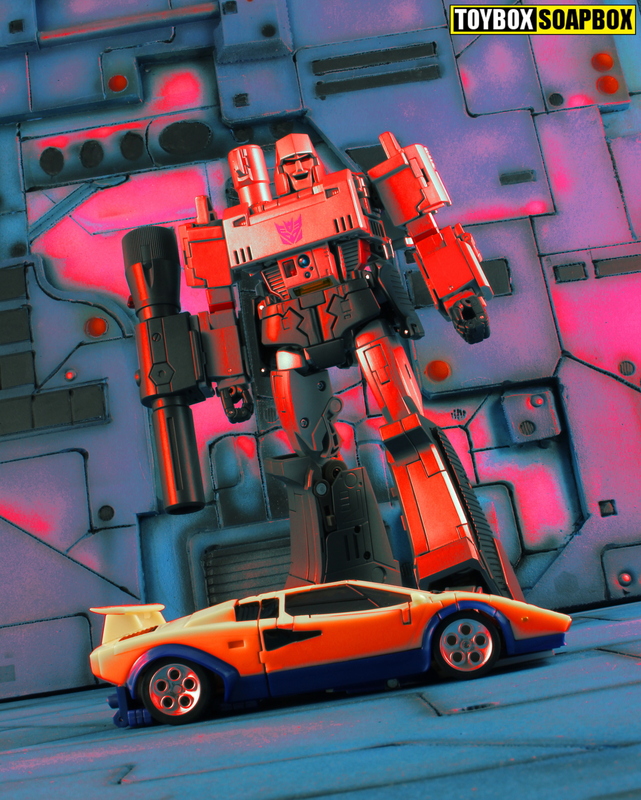 If scale is a thing that keeps you awake at night then fear not because Crackup is an adequately Masterpiece Autobot car bot matching height. Now, if you happen to be like me and have your bots and cons separated by shelves then Crackup can look like a bit of titch in a land of giants, but if he was any taller it wouldn’t make sense considering the established size of the pre-existing Lambo themed robot bods that currently exist in the Masterpiece scale. How this all lines up with the holy scale chart I have no idea as I have tried to purge it from my memory along with that time I accidentally flicked over to the E! channel on cable and was almost drowned in soppy reality TV rubbish. 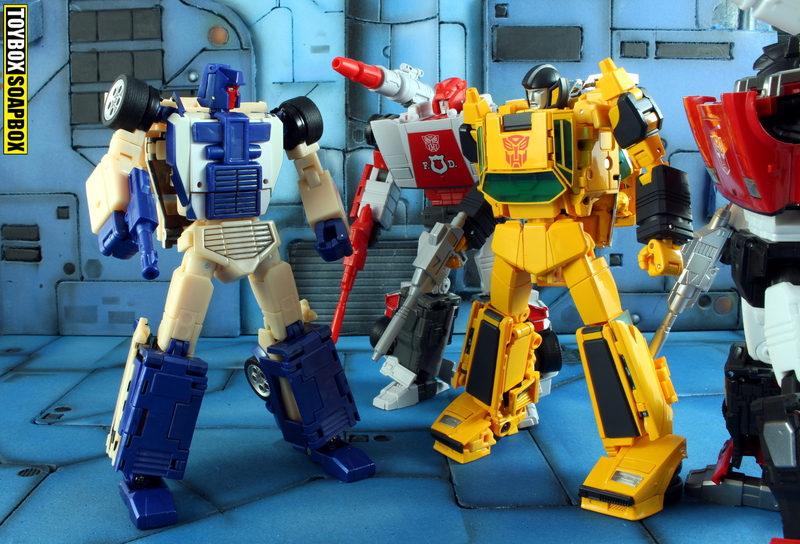 X-Transbots have always had a great reputation for their head sculpts and Crackup is no exception. His expression is an appropriate look of bamboolzement with hints of the paranoia that lurks within. XTB has resisted the urge to add a silly pointy chin beard that seems to be in vogue at the moment and for that I can only thank them. 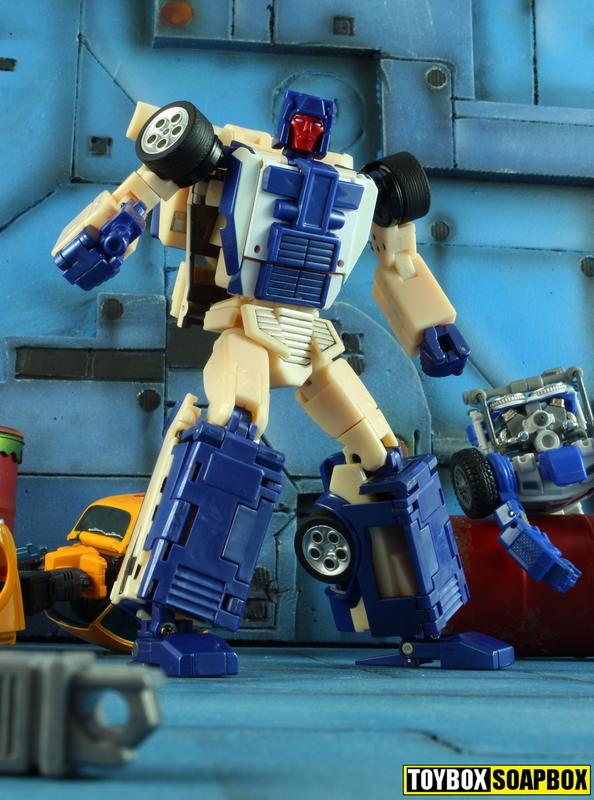 One of the few accessories packed in with Crackup is an alternate face but I genuinely cannot see enough of a difference to make me want to spend 20 seconds changing it. Should you be inclined to do so, it’s a simple case of flipping up the cat flap on the back of his head and using the provided Christmas cracker prize sized screwdriver. A third face option made an appearance in 598 Robots Toro demonstration video as a possible pack in with the a future Berserkar bot, and he had this to say when I asked him what the thinking was behind it: “Crackup was the first figure I designed in this set and by the time I worked on the other 4 plus the combiner face I felt like my faces had improved enough to try to update Crackup’s face so that it was a bit more cohesive with the rest of the team. I had a formula for designing faces and its far outlived its usefulness”. Articulation junkies are well catered for. Crackup has almost everything your little hearts could ever want. Double hinged elbows, ankle tilts, swiveling wrists, opening hands…I think that’s most of the checklist ticked off? All this makes him quite the poseable stud muffin. His crotch plate (get your minds out of the gutter) is cleverly done but the main attraction here is the ab crunch which combines with the heads ability to look downwards to give some great anime style posing options. Crackup’s feet are die-cast and despite the figures not insignificant backpack he balances extremely well. You can get him to bend pretty far backwards before he starts to even get slightly wobbly. Using the shoulders as locking points can force the little die-cast hooks, that hold the chest in place, out of place quite easily but it’s simple enough to avoid. My worry here is the small hook also acts as a block for the shoulders small transformational swivel hinge. If you aren’t paying attention when you move the arms upwards I could see the potential for breakage there, so just be careful. They’ve survived me mucking about with them when drunk after returning from a rare England World Cup win (only in the group) – so they can’t be that fragile. So Crackup looks great but how well does he hold together? As with the car mode, there are lots of tabs and locking points that help to keep most of him together. As mentioned before, the back pack doesn’t appear to lock into place but the hinge is tight enough to keep it in position. The tolerances are also good with the only exception on mine being the car door panel on the right leg which is really loose so frequently flops open if I move Crackup. Fortunately, that’s an easy fix and the precise reason I keep a bottle of Pledge floor wax next to my desk, despite my girlfriend’s moaning about me not doing the kitchen floor. Floor wax isn’t actually for floors, pfft, it’s for tightening joints on toys, everyone knows that – even Mary Berry. 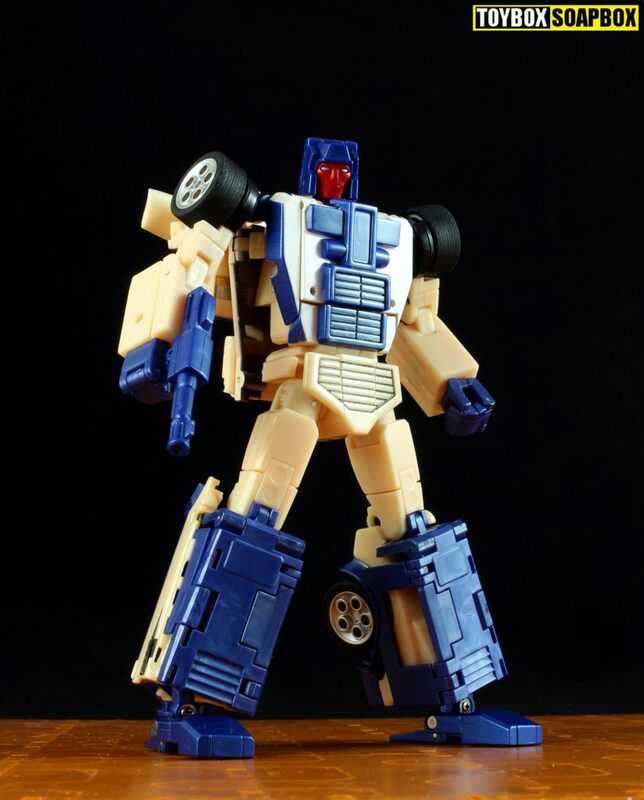 In the past, X-Transbots have had a reputation for producing great looking figures but not always the best quality control. Ollie was perhaps the nadir, with pieces of fragile, thin plastic that needed to be forced beyond their limits. 598 Robots points to a couple of factors that have played a role in XTB’s improvement in this area: “there’s been improved communication with the team in China and I’m getting test shots to study, make notes and changes. In general it’s not as rushed as it used to be”. Flying in the face of the current trend of throwing in every possible accessory with a figure, no matter how tenuous the link, Crackup is only complimented by the extra face and his small,blue pistol. I like accessories as much as Claires (it’s a UK shop filled with tat), but it’s nice to not have to find more draw space to cast unnecessary extra pieces into and the big bonus is that it means Crackup’s box is very small. As a person who is already low on space owing to an obsession with recreating an 80’s toy shop in my spare room, it’s a real struggle finding the room to store boxes. I am not the person who can just casually bin them without first attending some form of counselling either. So this is welcome and helps me not get stuck in a real life game of Tetris organising boxes within storage tubs. Right now Crackup is yelling “but this isn’t even my final form”, or he would be if he weren’t an inanimate object. One of the most important features of this figure is that he forms part of a larger combiner – joyfully named “Monolith”. There’s a lovely subtle statement that makes about the lack of articulation G1 toys possessed, but I don’t believe it’s intended to reference that. 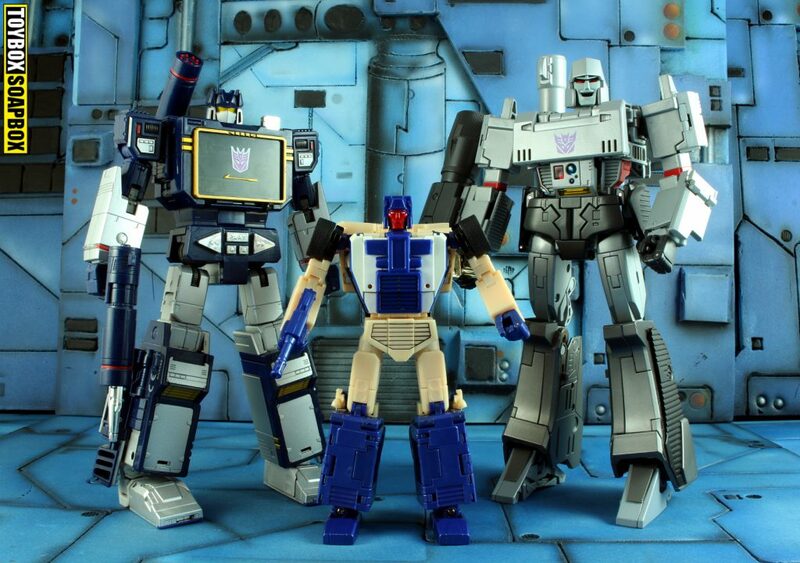 The original Stunticons were from the Scramble City sub group of figures which meant any of the smaller toys could become an arm or leg on any core bot that formed a torso. In fiction, Breakdown traditionally formed Menasor’s right leg and as this figure is so heavily invested in screen accuracy it drops the Scramble City element and opts for one fixed position. For some that may be a reason to grumble, but 598 Robots is happy to explain why that choice was made: “Crackup only fits on of the legs. Because the cars are all slightly different in terms of body shape and wheelbase I had to design monolith to only work one way. It’s hard to describe it but I believe it’ll all make sense when people see it in action. I loved that you can assemble the G1 combiner in a few minutes. I wanted that for Monolith. So you can go back and forth between the modes without having to allocated part of the day to getting it done”. Regular readers will know how highly I prize fun transformations and being able to play with the toys. So this is an approach I can happily get on board with. It should hopefully lead to a stronger combined form for Monolith as it doesn’t have to try to be all things. Each part is dedicated to one role so the focus can be on ensuring they fill that position better than Andrea Silenzi did up front for Forest. 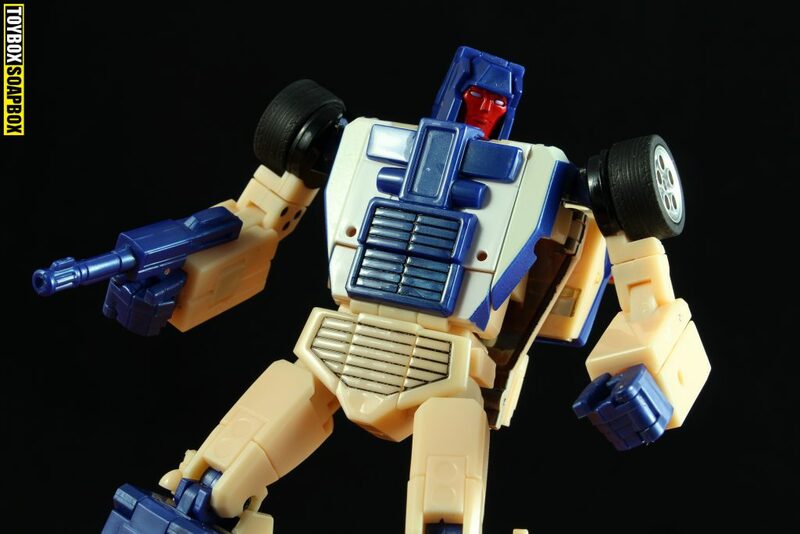 With recent releases, X-Transbots have done much to put their reputation for bad QC firmly in the past and Crackup continues that upwards trend. It sets a high bar for the rest of the Berserkar group to follow and if they can match or even exceed this opening figure then this has the potential to be a fantastic set of figures. Next up on the release slate is Flipout (Wildrider) who looks just as good and who I can’t wait to roll around my kitchen floor to wind the dog up. It’s one of those toys I’d go as far to say I need because I have an addiction to toys. For the price, Crackup is a steal and a great introductory piece for anyone wanting to test the third party waters or just get a great rendition of the character on the cheap. It also acts as a taster for hooking people into buying the whole group. If Crackup does not end up on my “Top 10 of 2018” list at the end of the year, when I’m drunk at Christmas and full of chocolate, then it will have been a very special year. Great review… I love my Crackup too. Quite a few folks on the forum have been wondering whether the cars on the arms of Monolith – which appear relatively larger than the cars on his legs – involve the use of larger “shells” of cars (over the cars themselves). Would be great if 598 Robots could clarify whether that’s the case… thank you.